The SVE Mustang King Cobra (1994) and the SVE Super Stallion (1997) were two Ford engineering exercises built to explore modernization of the SN95 platform by the addition of state-of-the-art SLA (short-long arm) and IRS (independent rear) front and rear suspensions. Ford knew that the SN95 platform, with architecture originally designed in the mid-seventies for the 1978 Fairmont, couldn’t remain competitive or leading edge in the market for very much longer, much less meet upcoming Federal safety (gas tank location) or crash (structural integrity) standards. The SN95 platform itself was simply was an update of the original FOX platform (an all-new platform designed for the 1978 Fairmont and 1979 Mustang, later used for the Thunderbird, LTD 2, Lincoln Mark VII, and several other cars). The SN95 is so closely related to the FOX platform that most SN95 parts easily bolt onto earlier FOX Mustangs. Why is the story of the King Cobra and Super Stallion story important? Because these two cars, along with the MN12 based Mustang production prototype, the FR500 showcar, and doubtless other lost engineering exercises, are an important part of the history of the Mustang. They show that Ford had a much greater vision for the Mustang than what we eventually received in production. They also show that Ford’s budget – as well as the vision and acceptance of the top Executives, was the constraining factor (with the exception of Jacques Nasser, who personally sponsored both the 1999 Cobra and the 2003 Cobra – and said at the 1999 introduction “Isn’t it about time we offered an IRS on the Mustang…!”). Those constraining factors continued thru the S197 Mustang, which cost it use of the full DEW platform and then before production an IRS suspension developed for the (dumbed-down DEW) S197 platform. Ford’s Special Vehicles Engineering (SVE) organization was at the time the internal engineering arm of the Ford Special Vehicles Team (SVT). SVT was purely a marketing organization at the time, and as of this date is a shell of its former self with basic engineering and testing carried out by the platform teams rather than a separate organization such as SVE. This change was introduced (with some internal controversy) because of the severe engineering and quality issues introduced by SVE re-engineering the cars as they saw fit, with much less rigorous engineering and testing before production release. Warranty issues were first seen in the 1994 Cobra (magnesium seat brackets and front suspension bushings, differing from the standard parts) and (as the SVT products further differentiated their engineering from the base products), the 1996 Cobra with it’s severe cooling and transmission issues, and then in the 1999 Cobra horsepower and cooling recall. Clearly a “post-engineering re-engineering” methodology had to stop and Ford eventually put an end to it. But before that, the two SVE cars shown here were examples of just that type of “band-aid” engineering. Only the supercharged 4.6 DOHC engine persevered, and it had more than its share of severe quality and warranty issues (perhaps the worst ever for SVT) as well (as this author personally suffered thru). 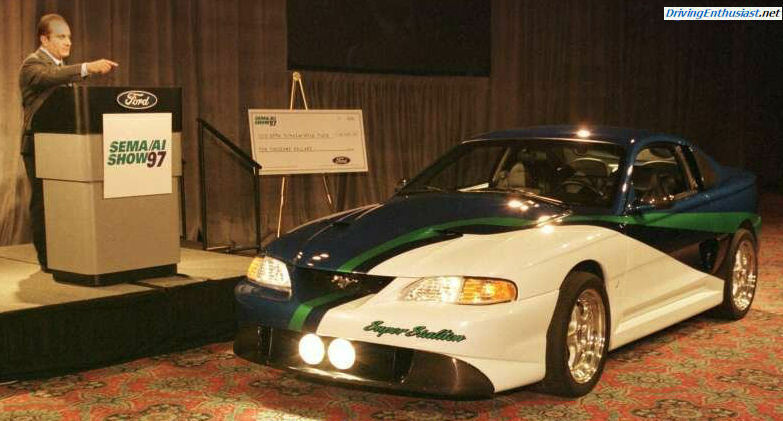 The SVE Mustang King Cobra came first, almost at the same time the production 1994 Mustang was being introduced. 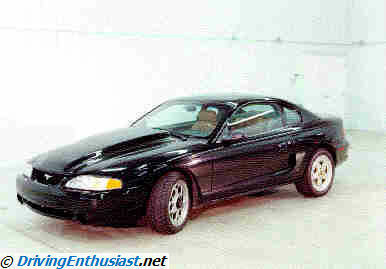 Due to cost constraints, the 1994 Mustang was introduced with ye olde iron pushrod 4.9 liter OHV engine. This was not what was originally intended when the SN95 platform was conceived (which itself was only a last-minute substitution for an MN12-based Mustang originally intended for the 1991 timeframe). 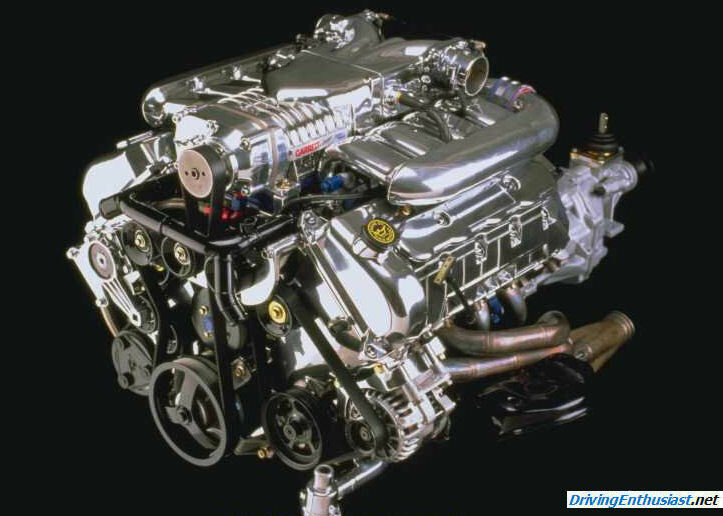 Ford had planned to use the “modular” 4.6 liter engines from the start, including the 4.6 DOHC engine introduced 1993 Lincoln Mark VIIII. However cost constraints held Ford back, so the old engine would have to suffice for the time being. Meanwhile, the future of the Mustang was being examined internally with the King Cobra. Images of the King Cobra – and it’s very existence – have never been released or discussed by Ford. It was purely an internal prototype of the originally intended SVT Mustang Cobra – a plan that was considerably dumbed down (and delayed) before final production many years later in 2003. The supercharged 4.6 is related to that of the Mustang Mach III, with changes suitable for production use. 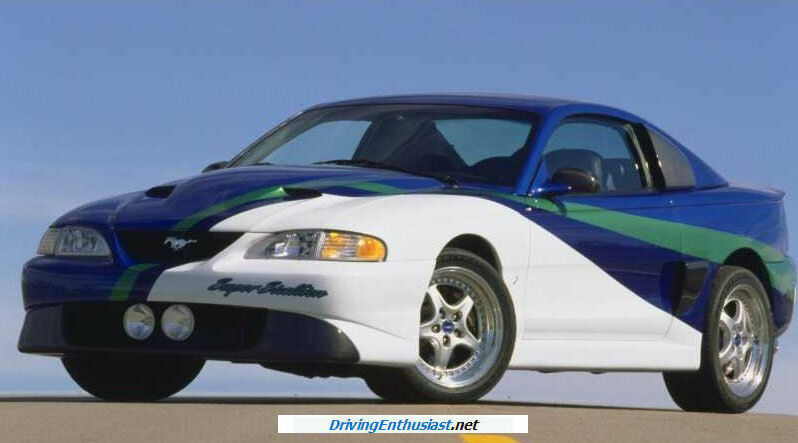 You’ll note that the layout below is very close to that of the 2003-04 Cobra. 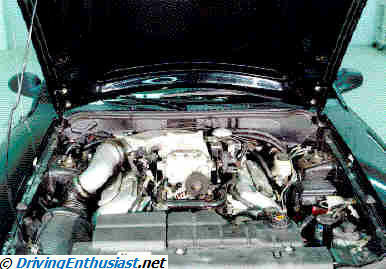 Elements of the 1996 Mustang 4.6 V-8 (SOHC & DOHC) can be seen here including the use of the Hydroboost braking system, the pre-production air filter, and the placement of the fuse box and other underhood elements. Many of the engineering elements of the future 2003 SVT Cobra can also be seen here – from the supercharger placement (although not the same supercharger), to the expansion tank for the intercooler, to the shape and location of the MAF, air filter, and air inlet. The battery, however, is located in the trunk – something that would prove impossible for the eventual production car. Note that the power steering reservoir is located where the battery would normally be found and that would also change by necessity. There was also an emphasis on building in anti-lift geometry in the independent rear suspension. It was apparent that this car would have a very heavy engine up front, and this architecture was necessary for handling and braking ability. Anti-lift would be an important benefit of the final production 1999 SVT Mustang Cobra IRS suspension as well. The Mustang King Cobra shows that SVE had in mind a demonstration of its suspension engineering capabilities. As we know, none of these major engineering elements made it to production. Nor has Ford been able to actually offer such a front and rear suspension on a production Mustang. It’s a shame that SVE and Ford fell so far after showing what they were capable of here, and again later on with the FR500. SVE program managers included Al Suydam and Steve Anderson. Team members included Ron Smith and Eric Tseng. A number of issues were encountered in the development of this car (and the related show car Super Stallion – which perhaps was one and the same car underneath?). The chief problem was excessive heat in the shocks – pushrod operated, and located in a “tray” in the trunk. The side vents cooled those shocks, but only to a degree. Also, of course, was the entire issue of cost: since the SN95 hadn’t been engineered for an SLA up front and an IRS in the rear, production costs would be excessively high – especially for a short run of 8-10,000 cars per year. As it turned out, as we now know for the 2003 Cobra, the SLA front suspension was dropped, the IRS was totally redesigned to make it considerably more production-friendly, and the supercharged engine would continue in development for a few more years before finally appearing in 2003. While the SVE Mustang King Cobra was originally an exploration of intended things to come, the Super Stallion was nothing more than a show car (introduced at the 1997 SEMA show). However, it did reveal to the public for the first time the front SLA and rear IRS development work that had been done. Several magazine articles of the time showed detailed photos of the front and rear suspension. Unfortunately, none of these unique suspension pieces would ever be seen again, much less in production. However, the improved 4-valve cylinder heads, the T-56 (previously seen in the Mustang Mach III show car), and the use of front Brembo brakes were an early indication of things to come on future SN95-based Mustangs. The bodywork of the Super Stallion takes a step forward from the King Cobra by providing proper room for much-needed larger wheels and tires. Custom front and rear fenders provide extra width and opening size. The King Cobra, given the standard early SN95 fender wells, was left at a strangely raked angle in order to get the needed wheels and tires under the car. Possibly this car was simply the King Cobra underneath, with the new engine added. In any case, when the car was revealed, the production 1999 SVT Mustang Cobra with it’s entirely different IRS suspension was already well in the pipeline and would be shown to the press 6 months later. 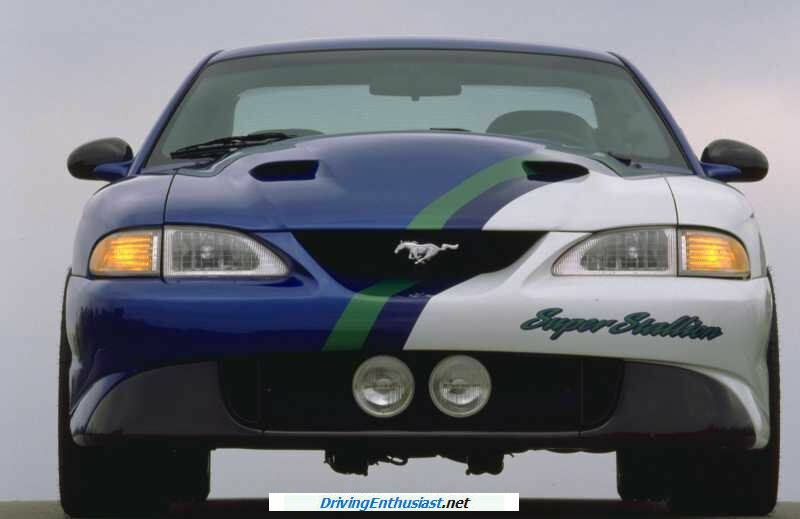 The reworked 1999 Mustang was the result of a 750-million dollar over-budget project, led by Janine Bay, including the cost of the design and production prep of the IRS that was used in production. This car, and the King Cobra, showed that Ford engineers were trying to give the Mustang a world-class suspension, despite the desperately outdated and unbalanced platform – and the intent to replace it with an entirely new platform after the turn of the century (delayed until 2005). A prior “last shot” at improving the FOX platform had been seen in the FR500, although that car was never (despite press releases to the contrary) intended as anything other than a show car. 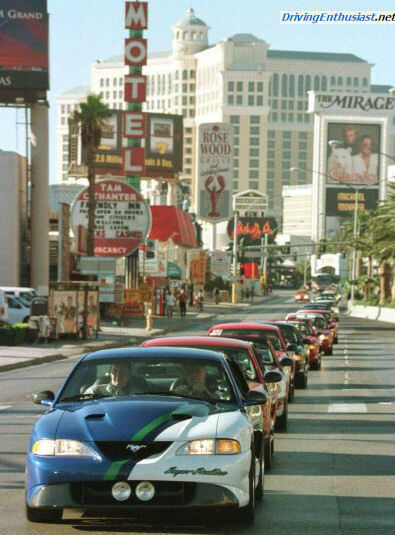 LAS VEGAS, Nev., November 3, 1997 – Roaring down the Las Vegas strip, the Mustang Super Stallion technology concept makes its debut at the Specialty Equipment Market Association Show. Leading the way in innovative powertrain and chassis technology while developing exciting, high-performance cars and trucks is the focus of Ford’s SVE group. Super Stallion serves as a test bed for new engineering processes in addition to reinforcing Ford’s product passion. While Super Stallion is not intended for production, many of its technologies may be considered for mainstream application in the future. Powered by a 5.4-liter four-valve DOHC V-8 engine with a high capacity Garrett supercharger, Super Stallion is capable of 545 horsepower at 6000 rpm and 495 foot-pounds of torque at 4750 rpm. Super Stallion’s engine was built at Ford’s Windsor, Ont., engine plant and was modified by SVE in Allen Park, Mich. The engine modification was made possible by the flexibility of Ford’s modular engine family. The overhead cam engines are easily modified because they share basic architecture, tooling and components. Out on the track, Super Stallion puts up some impressive numbers with a top speed estimated at 175 mph, a 0-60 mph time well under five seconds and a quarter-mile time of less than 13 seconds at 112 mph. Specially modified aluminum cylinder heads provide better air flow, while 16 injectors keep fuel pumping through the performance hardware. The engine compression ratio is 8.2:1. Air enters the engine through twin throttle bodies that are mounted to the high-capacity, clutch-activated, Garrett supercharger. This configuration relieves the engine of the parasitic losses incurred during the normal periods of “non-performance” operation. The end result is a significant improvement in fuel economy. Shifting into gear is made possible by a multi-disk McLeod clutch system and a Borg-Warner T56 six-speed manual transmission. Super Stallion’s engine is also equipped for flex-fuel operation. It is capable of running on gasoline, alcohol or any combination of the two. The system’s optical fuel sensor tells the computer the exact composition of the fuel allowing the EEC-V module to make necessary changes automatically. The benefits of having flex-fuel capabilities include cleaner emissions and improved performance, with the ability to achieve 50 more horsepower on E85 fuel. Super Stallion’s suspension is tuned for optimal performance, ensuring the car will remain stable even under maximum handling conditions. The front independent short/long arm suspension features an all new SVE design, replacing the standard McPherson strut system, and includes Koni double adjust shock absorbers. This configuration provides more negative camber during maximum turning, for improved cornering performance and anti-dive characteristics. Another innovative design is the competition-style independent rear suspension. The springs and shocks are part of a unique module that is mounted in the trunk minimizing the unsprung mass while providing exceptional anti-squat during acceleration and anti-lift during hard braking. The five-spoke, three-piece aluminum wheels from Speedline measure 18 x 8.5-inches in the front and 18 x 9.5-inches in the rear and feature 265/40ZR18 Eagle F1Fiorano Goodyear performance tires. Stopping power is provided by Brembo calipers and 13-inch vented discs on the front. The rear uses 12-inch vented Brembo discs. In addition, hard stops are controlled by electronic ABS. Stopping distance from 60 mph is 116 feet and from 100 mph is 310 feet with exceptional anti-fade characteristics. The aggressive stance and sleek lines of the production Mustang are enhanced by unique graphics and carbon fiber accents to give the Super Stallion a distinct performance look. An all-new hood design, with nostril-like openings, allows this beast to breathe a little easier. Improved air-flow into the engine compartment keeps the 5.4-liter V-8 cool under the most intense driving conditions. The front fascia has been modified to include two large, round driving lights along with integral ducts that feed air to the engine, while the rear fascia features integrated dual exhausts. Both the front and rear treatments as well as the mirrors and scoops are made of carbon fiber to keep weight at a minimum. The quarter window ducts and quarter panel scoops allow for rear shock and brake cooling, which ensures peak performance of these vital components. The rear decklid and spoiler have been modified to improve the aerodynamics of the car and provide outstanding high-speed stability. A dramatic exterior graphics package completes Super Stallion’s “street racer” appearance. The car takes on two different personalities with radically different color configurations on each side. The passenger side is painted in a deep metallic blue base color giving the car an unassuming look, disguising its true power. In contrast, the driver’s side is white and stands out to give Super Stallion a menacing look, hinting at its true capabilities. Super Stallion’s interior features four leather-wrapped ebony bucket seats. The front seats include integrated three-point safety restraints, which improve the rear seat ingress/egress, and dynamic seat bolsters. The seat bolsters are unique in that they articulate to hold the occupants in place during hard cornering. The bolsters retract to make entry and exit of the vehicle more comfortable. Keeping track of all of Super Stallion’s systems is made possible by an on-board performance diagnostics system mounted in the headliner. In addition, two extra gauges are mounted on the A-pillar to monitor intake manifold vacuum/boost and fuel system pressure. The rest of the performance-oriented white faced gauges are housed in the instrument cluster. The supercharger is activated with the flip of a switch that is mounted in the center stack area of the console. When the system is on, the “armed” light is illuminated and Super Stallion is performing at its ultimate. Also found in the center stack area is a digital readout that measures the amount of alcohol present in the vehicle’s fuel. The center console runs the length of the car and houses the leather-wrapped shifter. It also provides extra storage space and cup holders for the rear passengers. To complete the driving experience, Super Stallion is equipped with a Mach 630 watt sound system from Visteon Automotive Systems. The radio/CD unit is housed in the instrument panel and features two amplifiers, a center image speaker mounted in the dash, 2.5-inch speakers in the A-pillar sails, 5.5 X 7.5-inch woofers in the doors, three sub-woofers and two mid-range tweeters mounted in the package tray.